This is the easiest way of doing Rava Kesari and my mom taught me this. 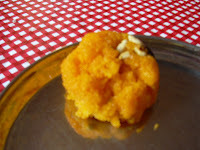 I usually make Rava kesari in Microwave and not in the stove. That is what I am going to share. Take a microwave safe pyrex vessel(avoid using plastics) and put Rava + Cashews + Raisins with a drop of ghee and keep it in the microwave for a minute. Now add water, sugar, milk, cardamom powder, kesari color and pachai karpooram to it and mix it with a spatula. Keep it in the microwave for another 1 1/2 to 2 minutes. Take it out and stir it thoroughly and again keep it in the microwave for another 2 minutes. Now pour the remaining ghee into it and keep it aside for a minute. After a minute you can serve it. If you have unexpected visitors for lunch or dinner, this is the easiest way of making a dessert. This is my personal experience. Try it and lemme know your comments. The pyrex vessel should be dry before adding everything. Roast cashew and raisins with a drop of ghee to golden brown and keep it aside. Roast sooji in the same pan, till nice aroma comes. Keep it aside. 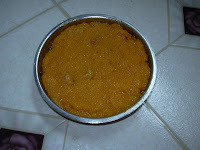 In the same pan, add milk and water, kesari color, pachakarpooram and cardamom powder and bring everything to boil. Now slowly add sooji and stir it with whiskers. Cook it till water is fully absorbed. Now add the sugar and mix it will. Add roasted cashews and raisins and the remaining ghee and mix everything well. Turn off the stove when the required consistency arrived.